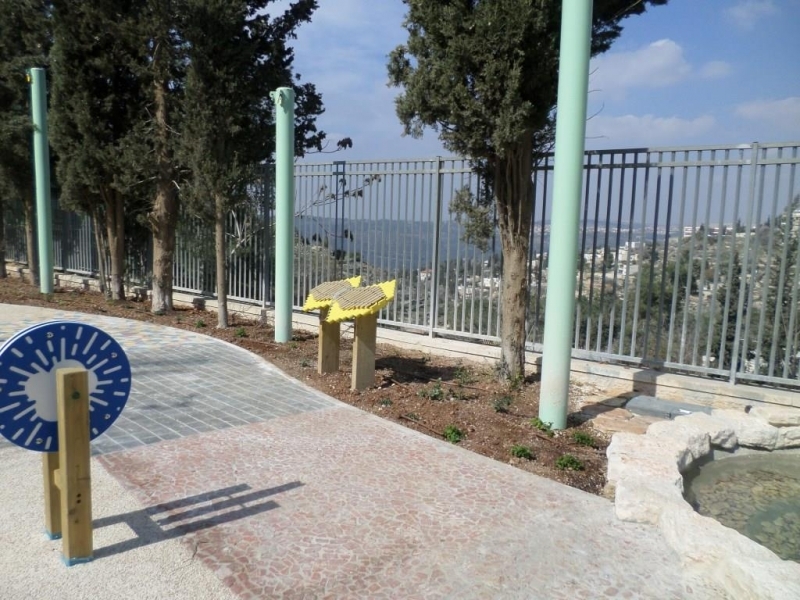 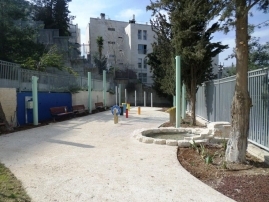 2019-04-07 18:00:45 - Recently realized by Kesem Yarok - this new music garden for special needs school Maayan in Ein Kerem, a picturesque historical part of Jerusalem. The chosen locations show a nice mix of garden and school yard. 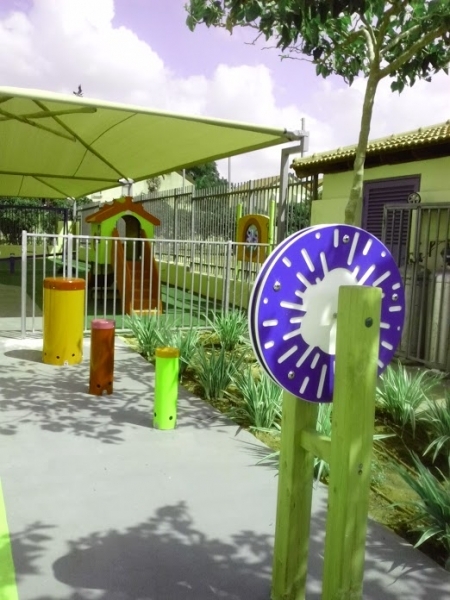 With a rainwheel, a huge turtle drum and the metallophone Cherub installed on the natural soil, and our colorful congadrums and xylophone on the terracotta tiles under the olive trees. 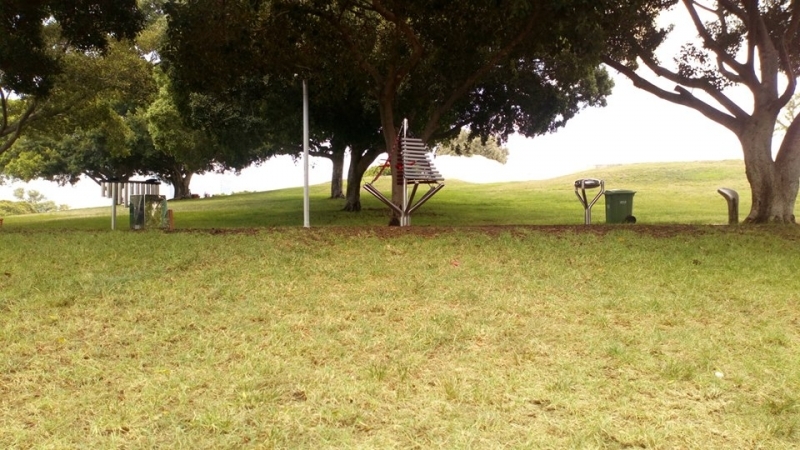 Beautiful sounds, great atmosphere! 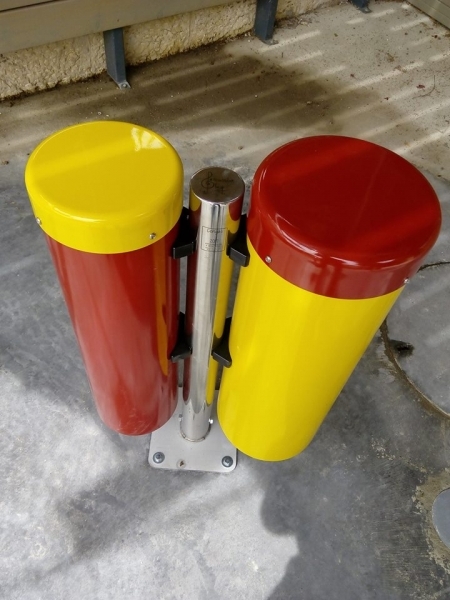 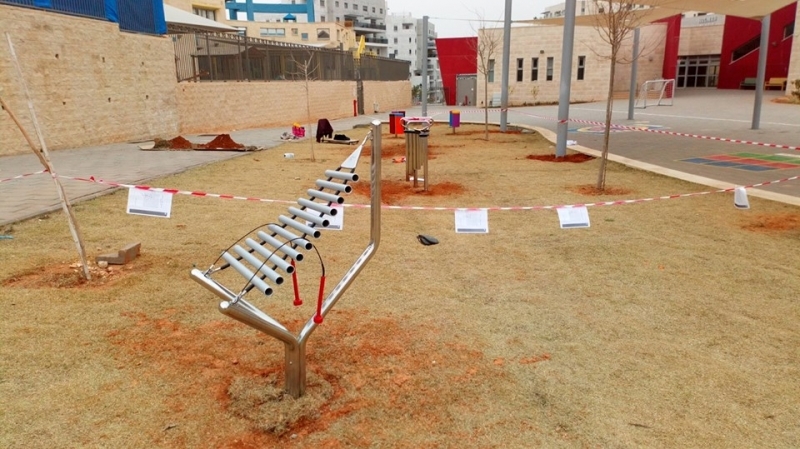 2019-02-07 17:42:42 - In the southern Israeli town of Ofakim we have installed a number of outdoor musical instruments. 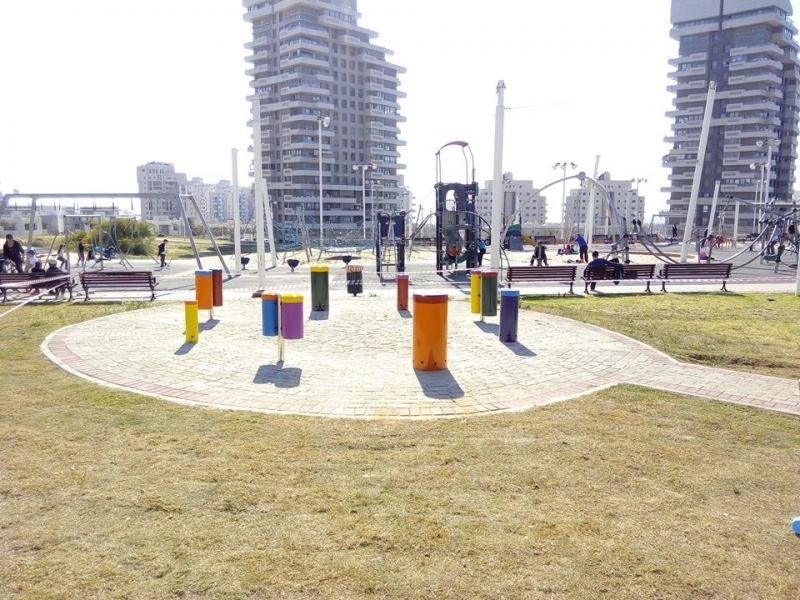 Currently this park is still under construction as the photos are showing, however soon this park will offer its visitors the possibility of making beautiful outdoor music on Percussion Play drums, aerophone, cajons and marimba's. 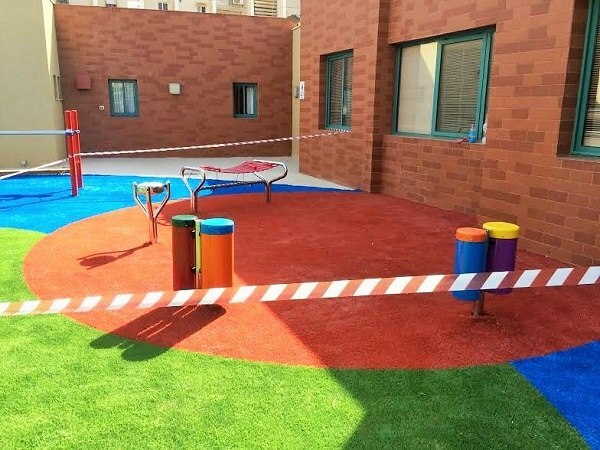 More pictures after the opening! 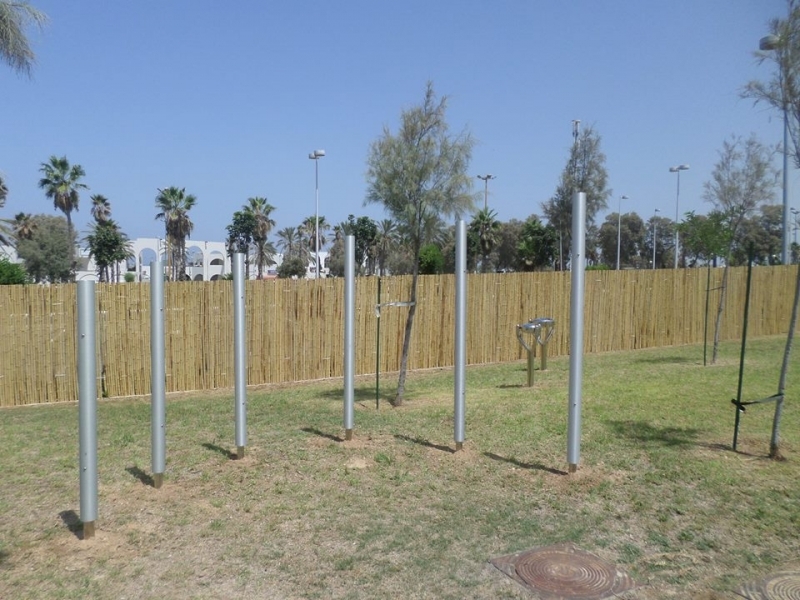 2019-01-07 05:20:25 - Great installation in a Park HaYam ("Park near the sea") in the Israeli city of Ashdod, containing the tall aerophone Tembos and the Bell Lyre, both instruments are amazing as well in sound as in appearance. 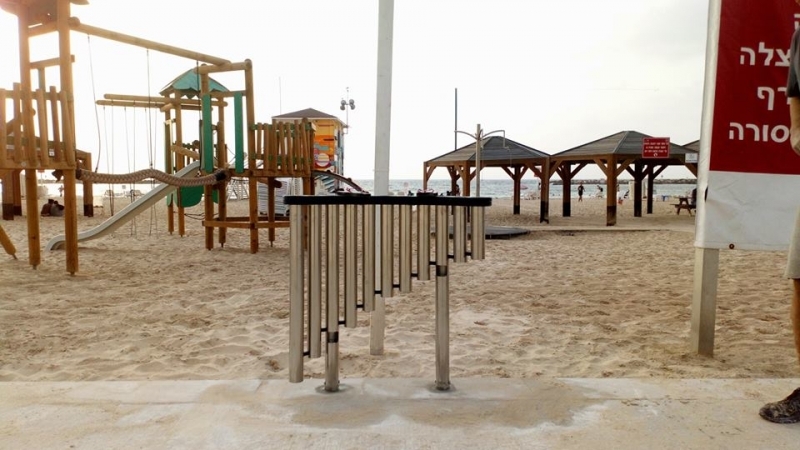 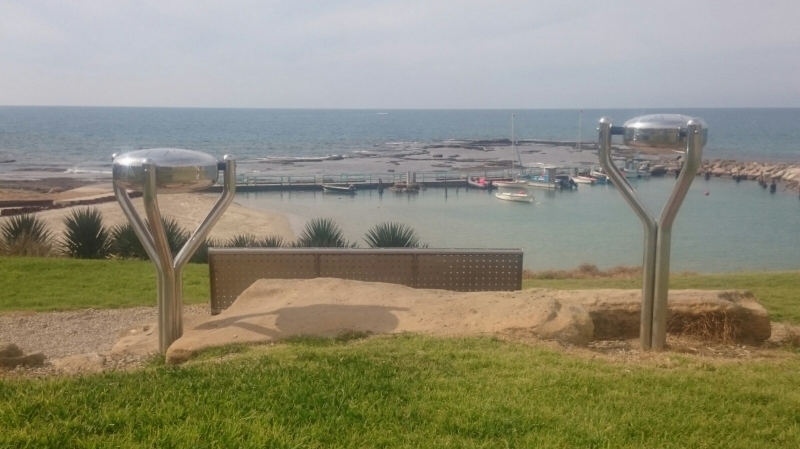 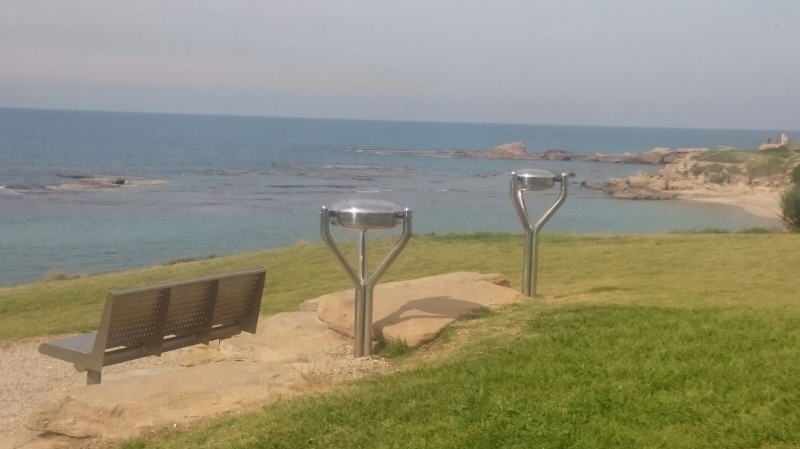 Due to the salty sea air, for the municipality of Ashdod it was also important that the instruments were made of stainless steel - therefor these Percussion Play instruments are an excellent choice! 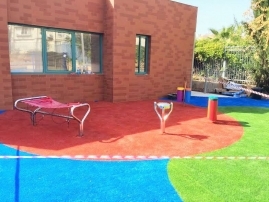 2018-11-08 15:11:36 - Kesem Yarok uplifted this school yard of primary school Eshkol in the Israeli town of Rosh Haayin. 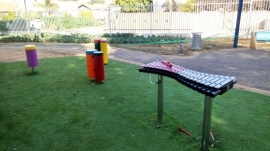 Children and teachers can now enjoy beautiful outdoor musical instruments such as our rainbow colored xylophone Cavatina, a set of 3 Congas drumpairs on stainless steel posts, an impressive butterfly-shaped metallophone called Papillo and the babel Drum - a tongue drum played with the finger tips or side of the hand and one of our most popular instruments. 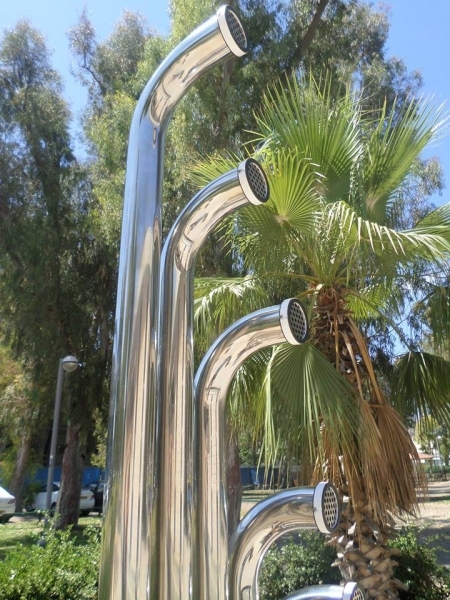 2018-10-15 14:11:46 - When you visit the popular Frishman Beach in Tel Aviv, don't hesitate to play these stainless steel handpipes. 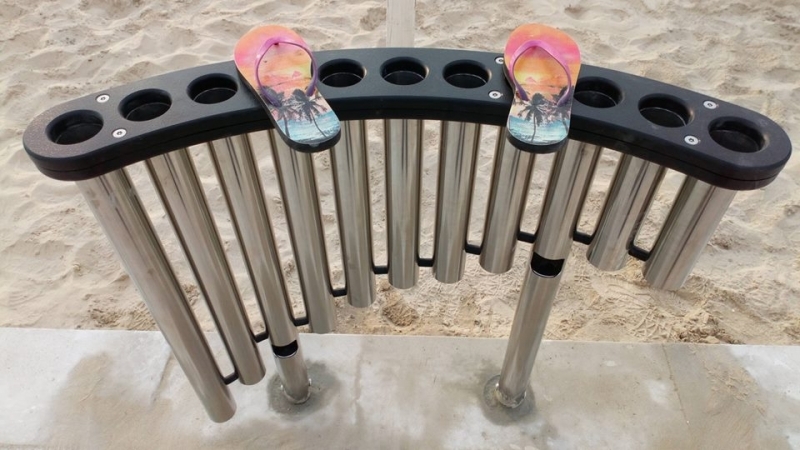 A great aereophone that allows you to play funky tones just with your flip flops! 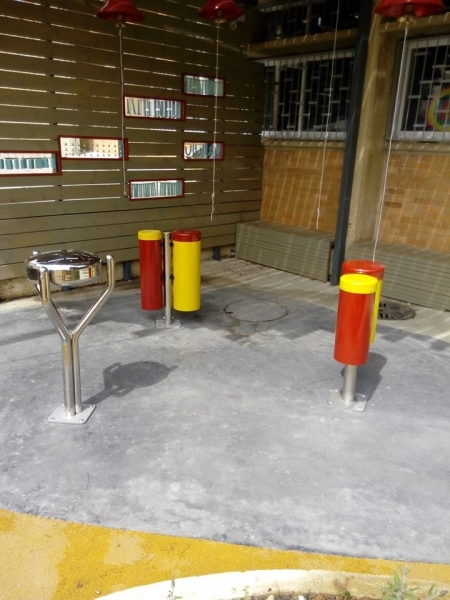 (or hands). Special thanks to David Sharfi and Arik from the City of Tel Aviv for their inspiration and this absolute magnificent location. 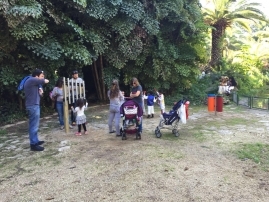 2018-10-01 13:57:35 - Installed in the Edith Wolfson Park for the municipality of Tel Aviv this nice music garden for - as you can see on the pictures - young and old(er)Percussion Play instruments are robuste, suitable for all environments and a great tool for connecting people! 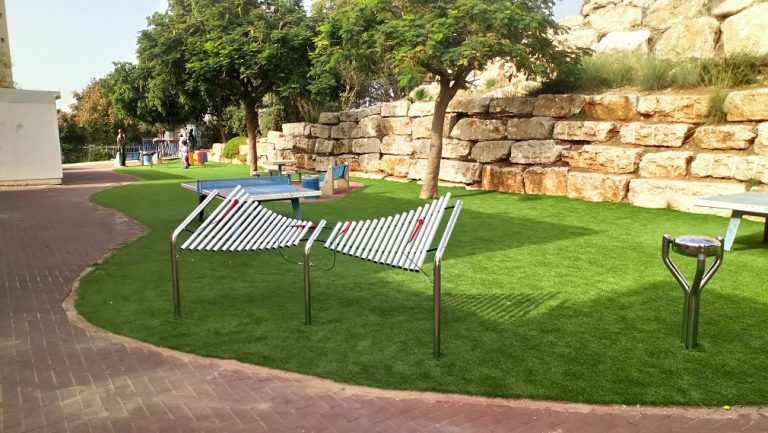 2018-08-14 11:28:21 - As published in a previous news item we are happy and proud to show you here the results of our installation in Siach Sod, a cultural center in Ramot - a Jerusalem suburb. 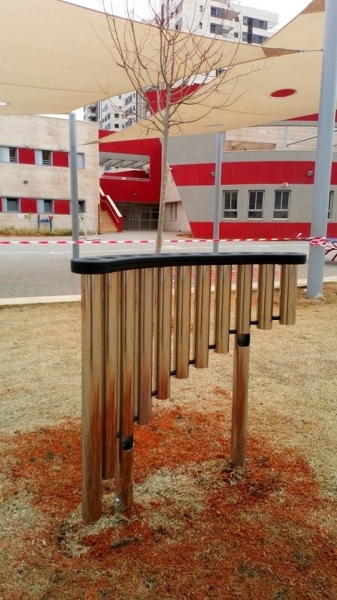 We have installed here some really remarkable Percussion Play instruments for outdoor use, such as our Bell Lyre, our aerophone Tembos in a pentatonic tone setting, the xylophone Duo, a stainless steel Babel drum as well as a set of colorful Conga drums and last but not least a musical fence with a length of 6 meters! 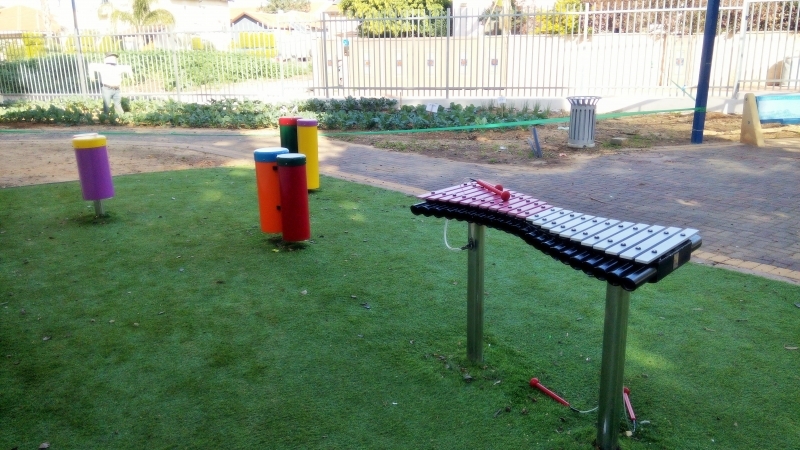 Outdoor musical instruments - connecting people - what a great way to play outside! 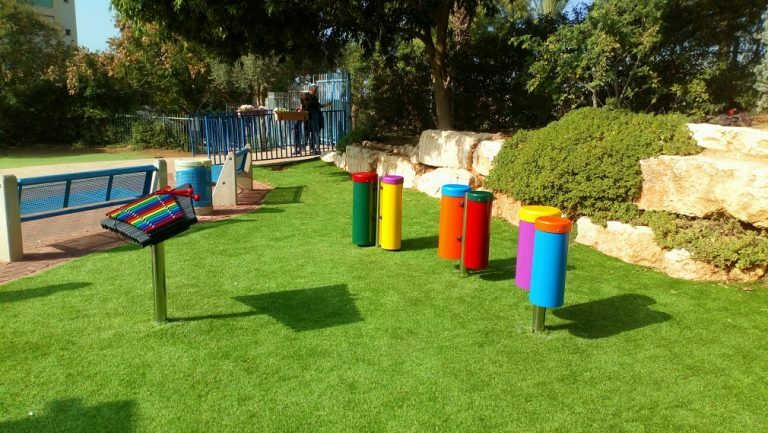 For Keren Or Jerusalem center for blind children with multiple disabilities Kesem Yarok has installed this brand new music garden. 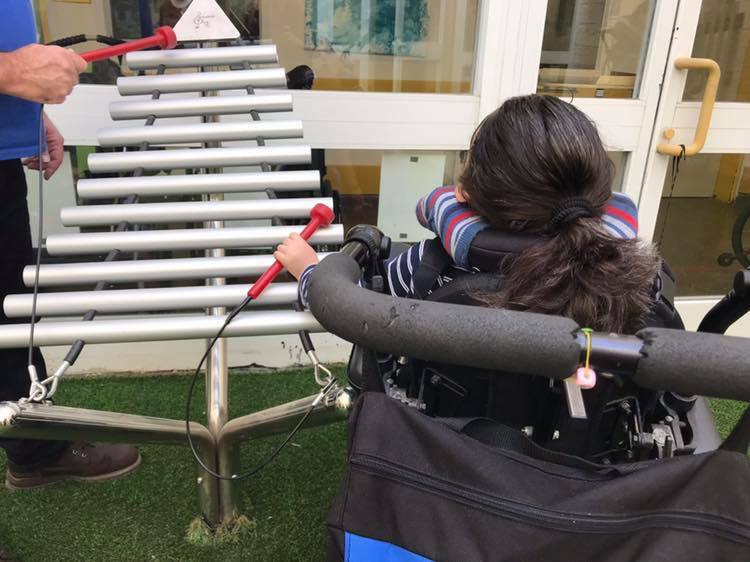 On the pictures a well balanced symphonie containing our outdoor xylophone Duo, a set of Congas drums and the 4 tall Tubular Bells good for an everlasting sound experience for body and ear. 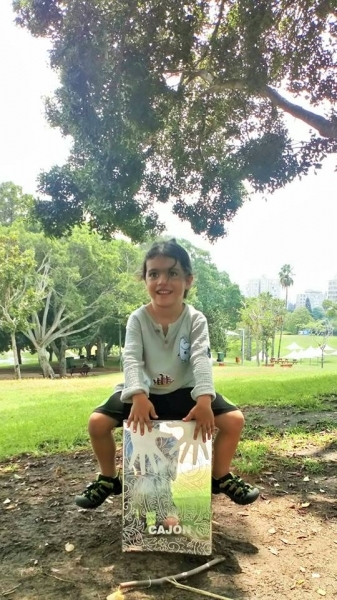 Keren Or - thank you all for the great colloboration! 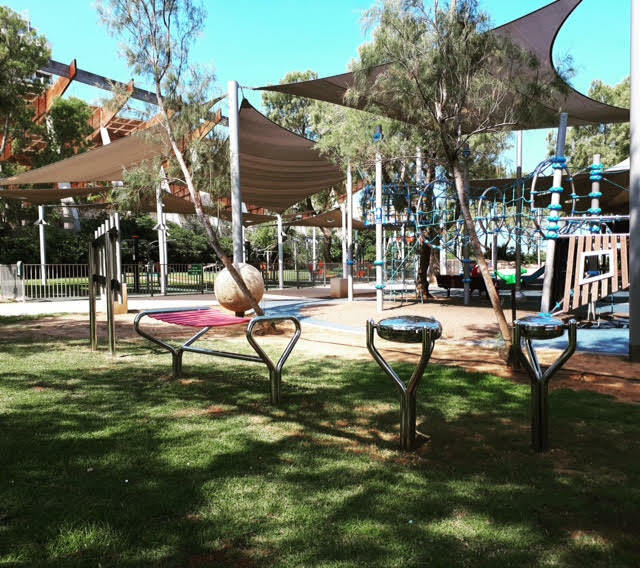 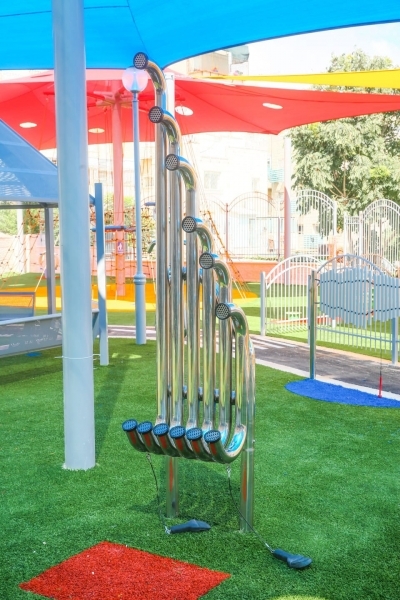 2018-07-19 15:46:22 - This Playground in Tel Aviv recently got a musical upgrade. 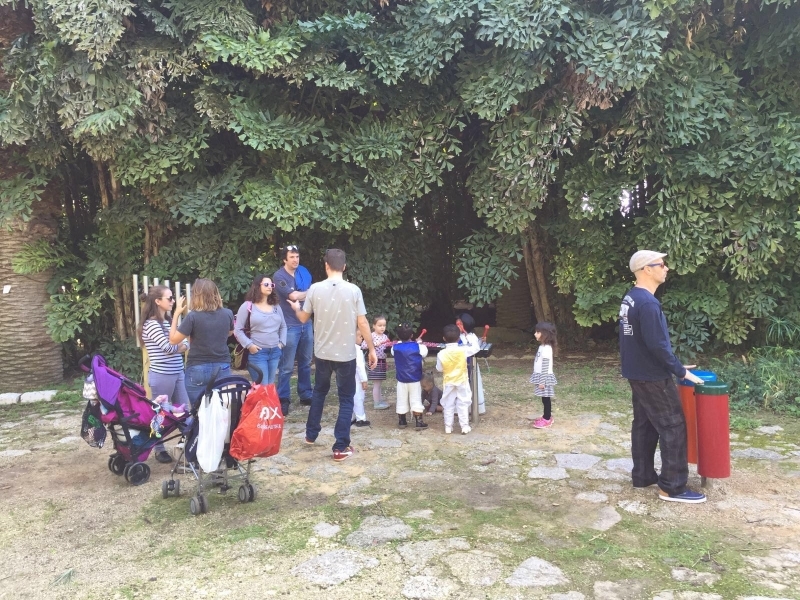 After all the climbing and physical efforts, children (and parents) can now make nice outdoor music together! 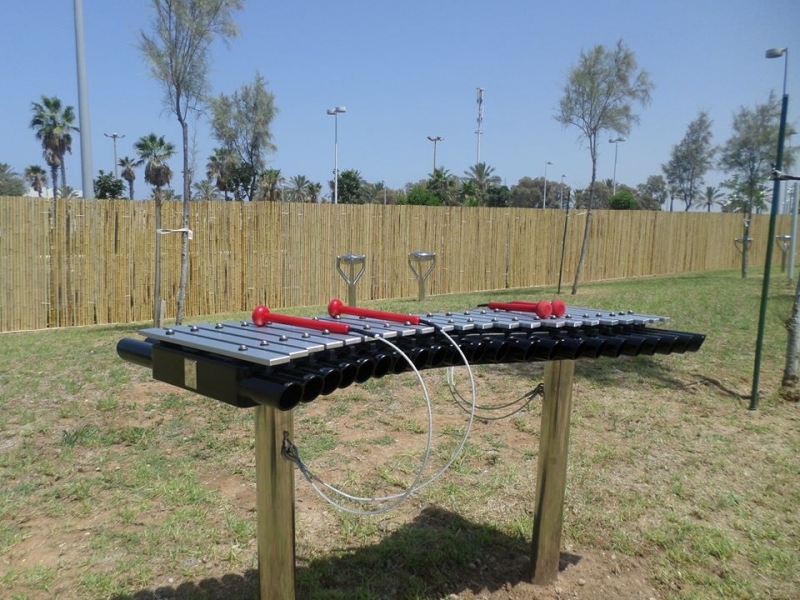 On the picture: 2 Babel Drums, a large outdoor xylophone Marimba and a vertically installed Free Chimes metallophone. 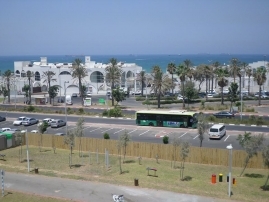 Client: Municipality Tel Aviv. 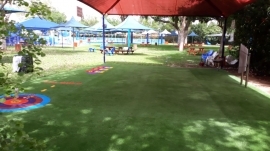 2018-06-24 15:09:48 - At Country Club Neve Sharet in Tel Aviv we this musical corner on a field of artificial grass. 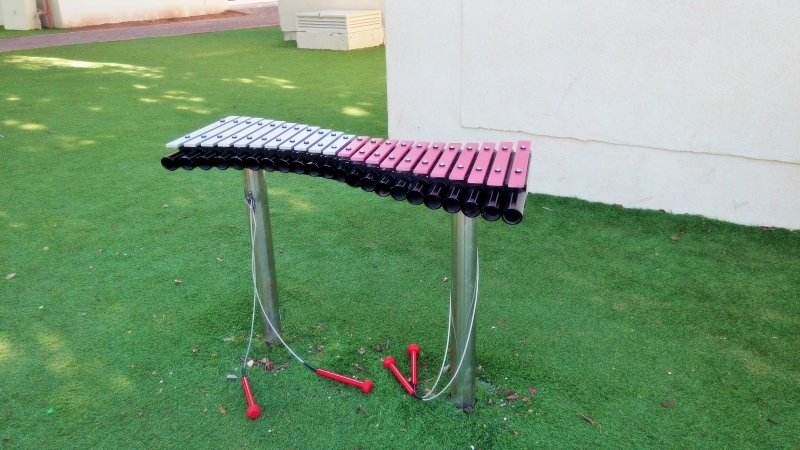 Installed instruments are adjusted on play level for the youngest players: xylophone cadenza with aluminium tuned notes in rainbow colours, a vertical metallophone 'Free Chimes' and a set of Congas drums (not on this image). 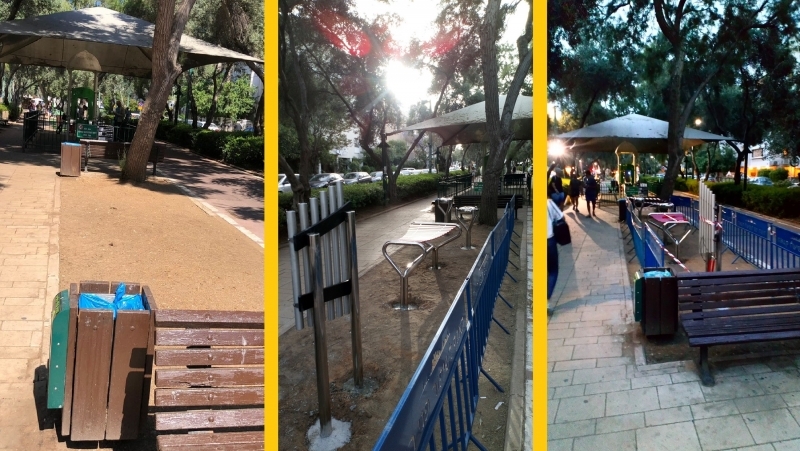 Client: Municipality Tel Aviv. 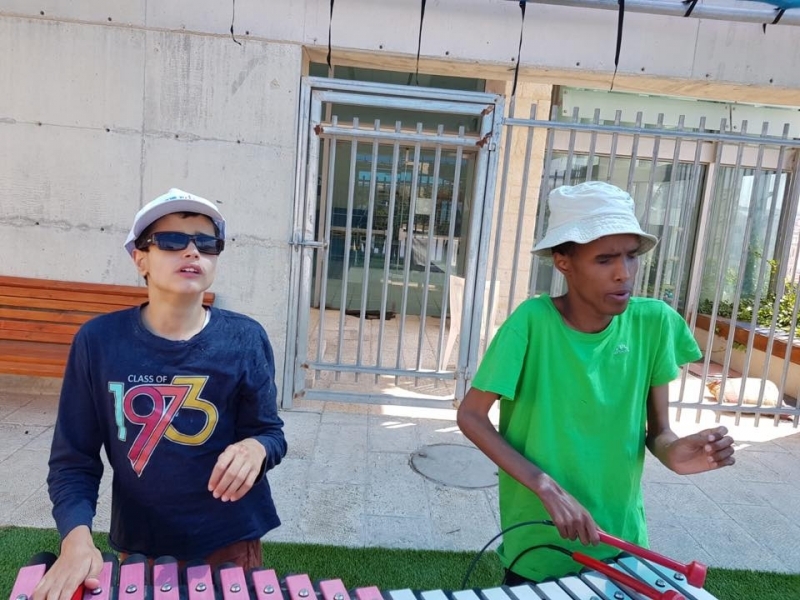 2018-06-19 13:50:28 - For this shopping centre in Neve Ya'akov (Jerusalem) we have realised this fantastic musical shopping trail. 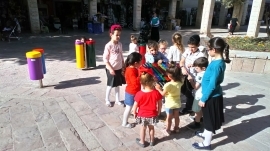 Young and old gather together enjoying the fun of making great sounds in the open air. 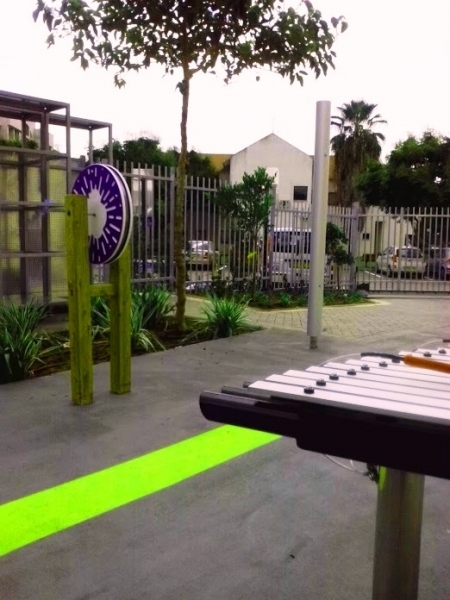 On the pictures our Sansa Rimba, the colorful Congas outdoor drums, as well as a Marimba accompanied by 2 Cajon drumseats. 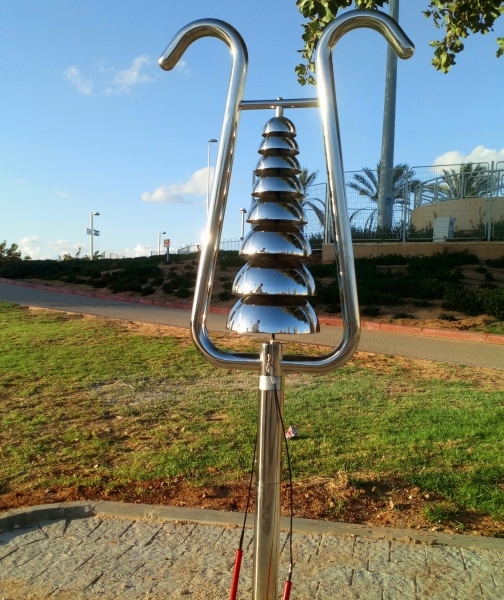 Furtheron our stainless steel Tembos aerophone and a set of 3 Emperor Chimes. 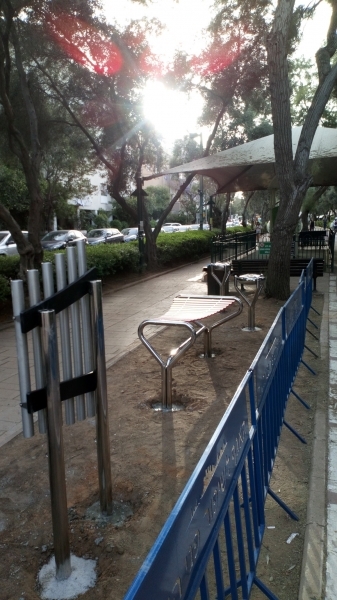 Have a look at this nice musical metamorphosis in the heart of Tel Aviv. 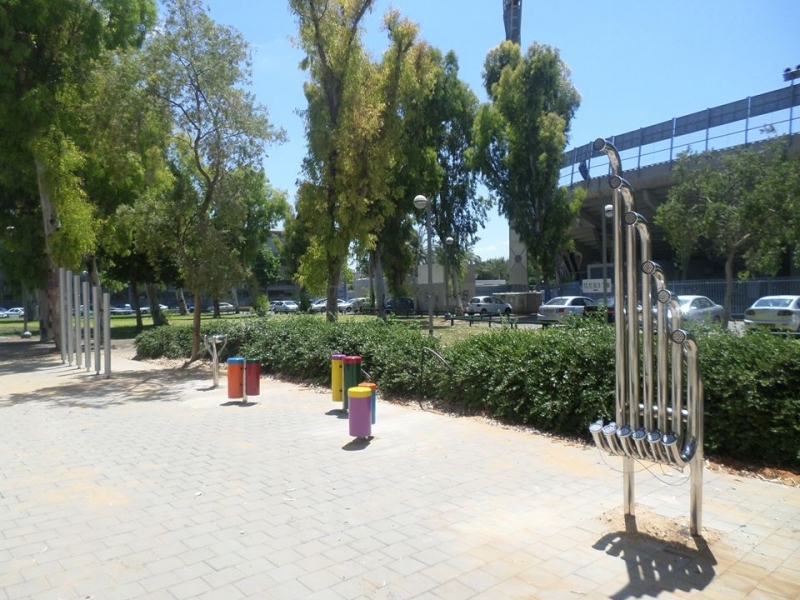 On the boulevard Sdrot Ben Gurion we have installed our outdoor musical instruments. 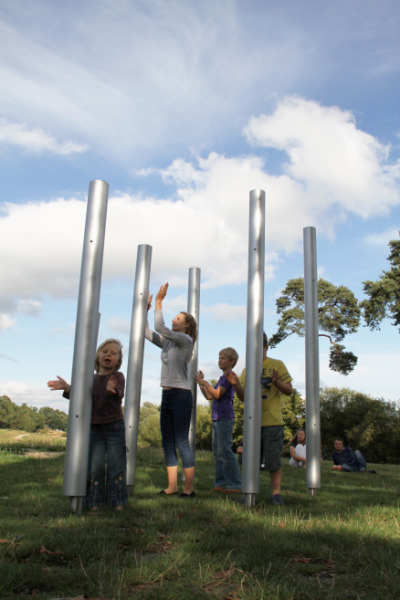 On the photo's stainless steel Babel drums, marimba and the vertically installed freechimes. 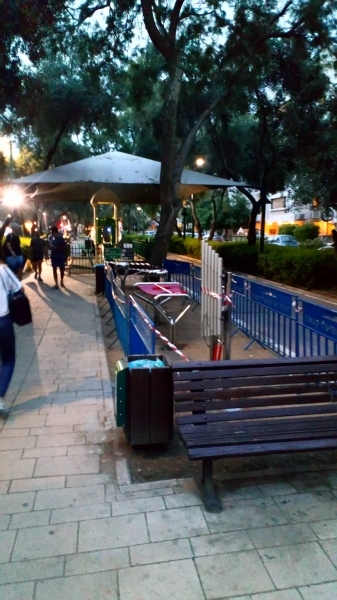 Great reactions of the passers by during installation and a fantastic cooperation with the City of Tel Aviv! 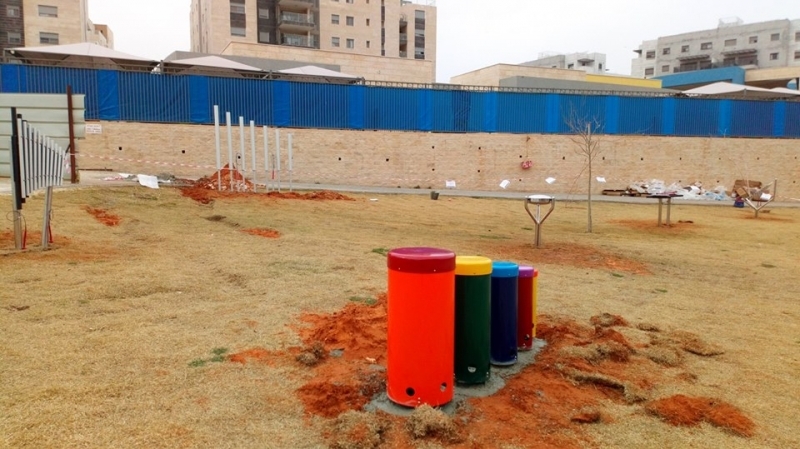 2018-04-26 17:11:48 - For this school (Beit sefer Peres) for primary education in Rosh HaAyin we recently installed this giant music trail consisting of many outdoor musical instruments. All instruments have been situated on the lawn which will be further on this spring time completed with seating areas - We wish children & teachers many ours of lounge and play! 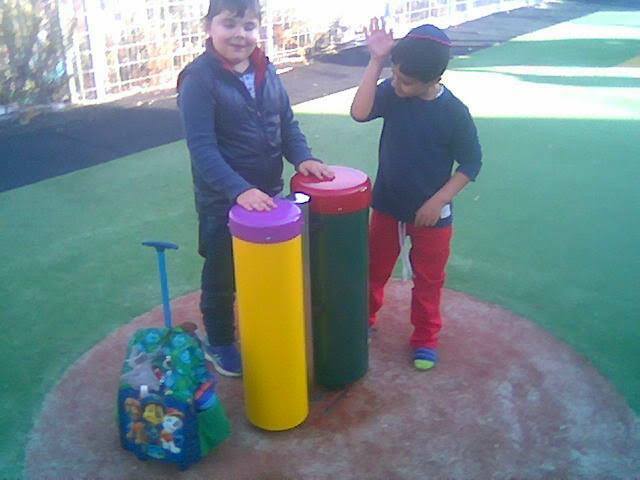 2017-11-05 20:48:08 - On two locations for special education Kesem Yarok installed this series of Percussion Play instruments. 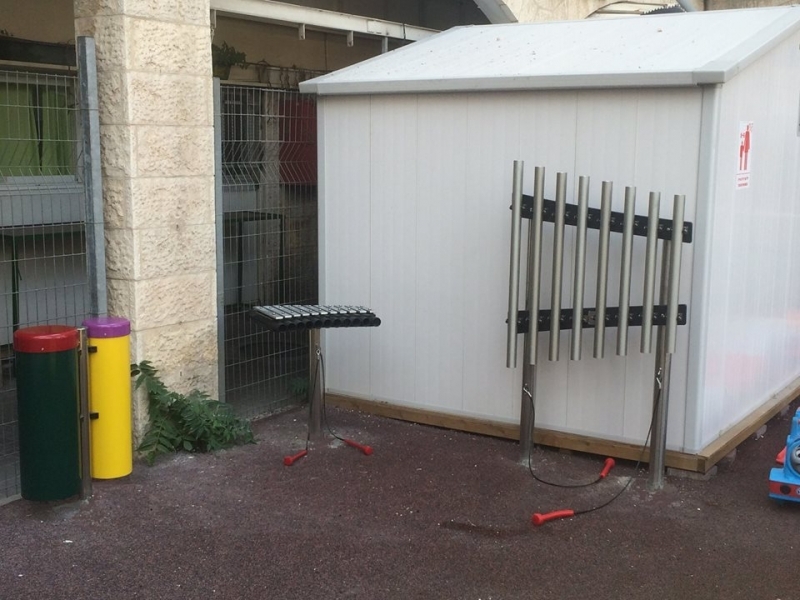 In Jerusalem at the Meshi school the children can enjoy now the outdoor xylophone Sansa Rimba and a stainless steel frame with fine tuned aluminium Free Chimes, vertically arranged in a diatonic scale. A set of colorful Congas drums completes this nice ensemble, a drum rythm also picked up on the second location, the Lev Tahor school in Neeve Yakov. 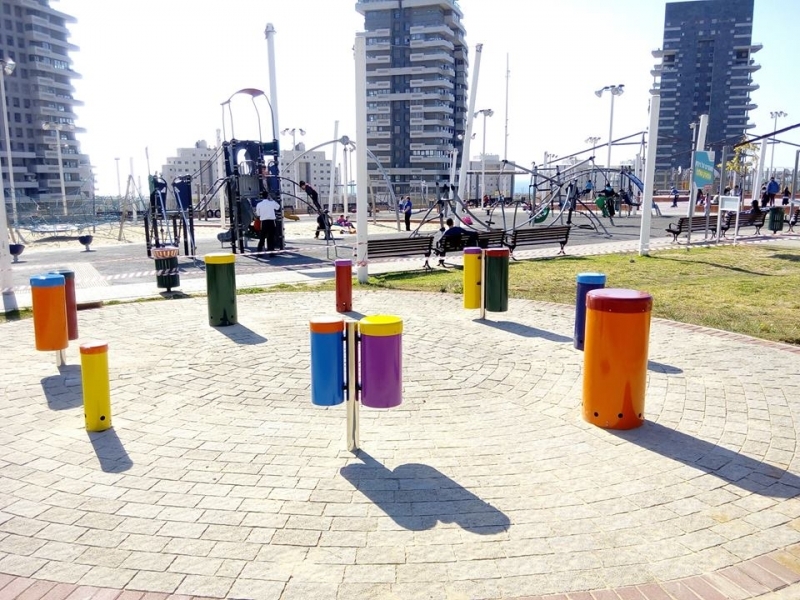 2017-03-27 20:58:42 - This full drum circle we have recently installed for the City of Ashdod. 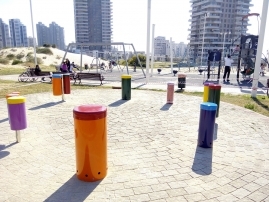 By having them installed on this paved plaza and keeping the right distance between them, these drums are also accessible for wheelchairs - inclusive play and drum fun meet together! The beautiful colours are making the picture complete, very appealing to young and old. 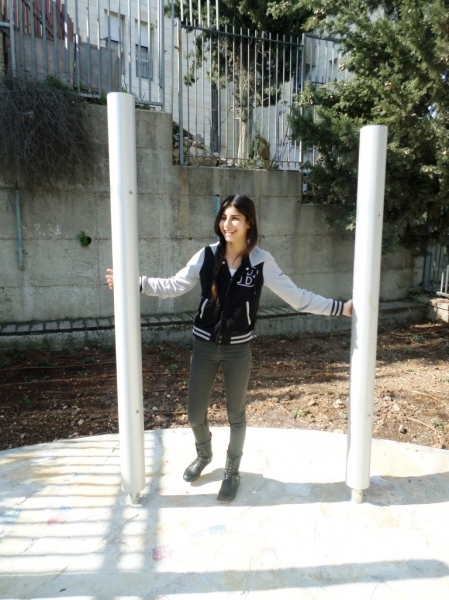 2017-03-23 20:41:07 - For special needs school Ilanot in Jerusalem Kesem Yarok uplifted its schoolyard with a set of Congas Drums, a Large Babel Drum and a symphony of 7 Tubular Bells - these tall chimes not only sound fantastic on each strike, they're also giving you the vibes! 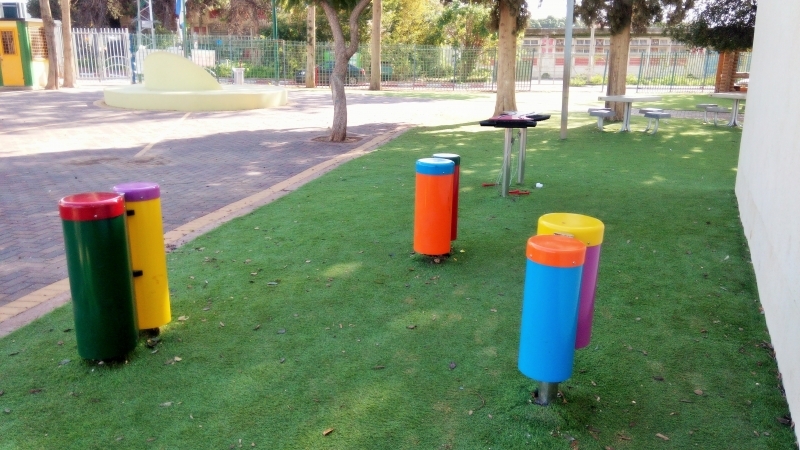 2016-11-04 20:09:34 - For this kindergarden center Ganei Flora (Flora Gardens) in Haifa we have installed a nice composition of outdoor instruments. You can find here 2 pairs of colorful Congas, very appealing to young children, a stainless Babel drum and our Marimba with large beaters that will always find the right tune to play. 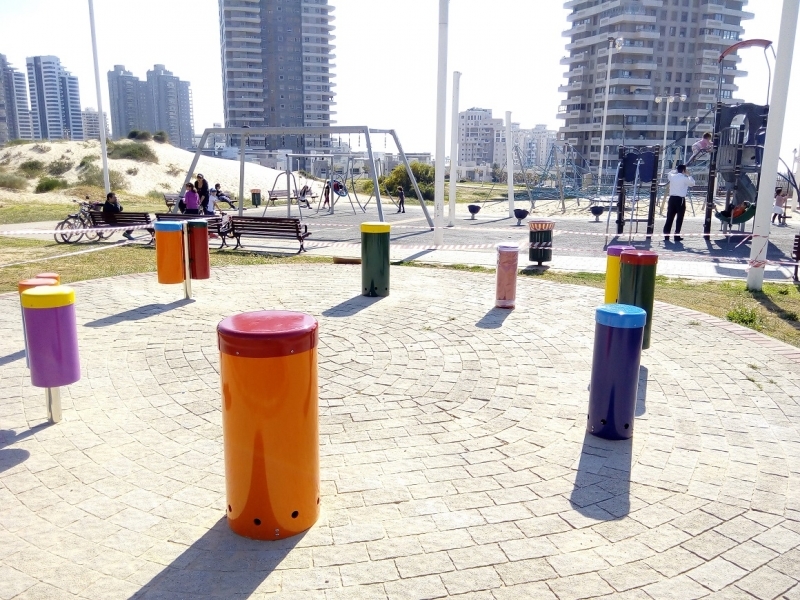 On their beautiful seashore, the residents of Kibbutz Sdot Yam frequently gather together for a drum session on these fantastic Percussion Play Babel Drums accompanied by the rythm of the Mediterranean. The stainless steel drums have been installed last year and are a great succes, according to the people of Sdot Yam. 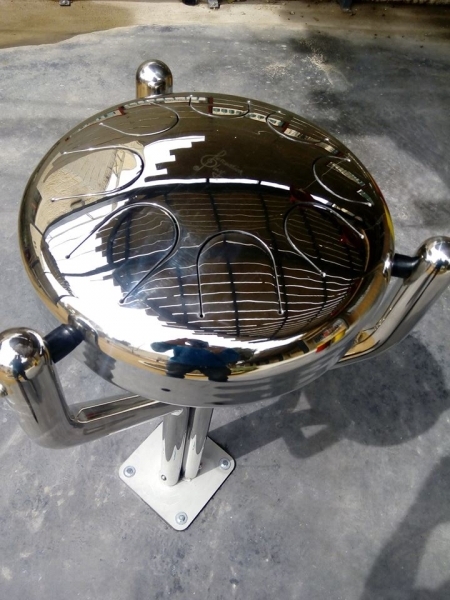 We invite you to have a closer look at our Babel drums by clicking here. 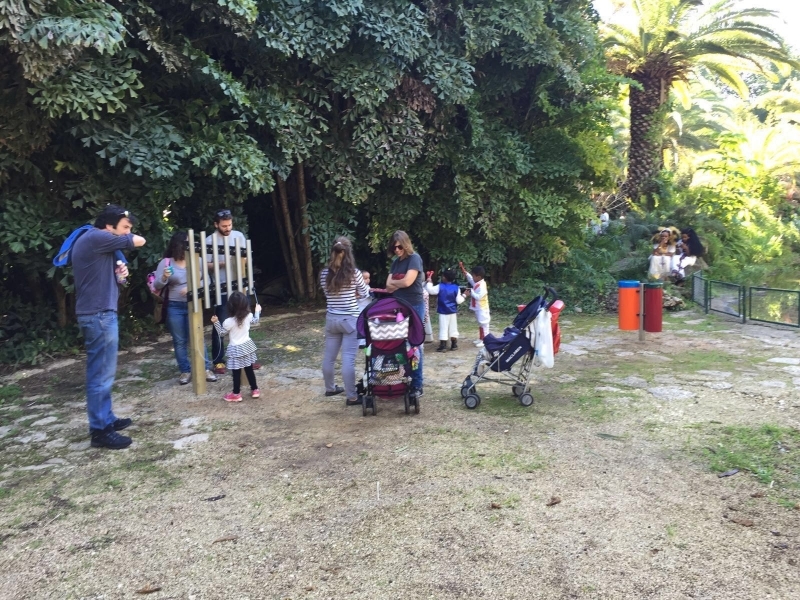 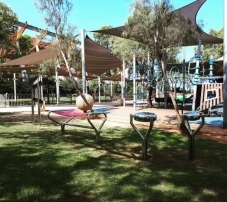 2016-02-01 10:15:30 - Now visitors of Park Ganei Yehosua in Tel Aviv can enjoy the fun of making outdoor music together. 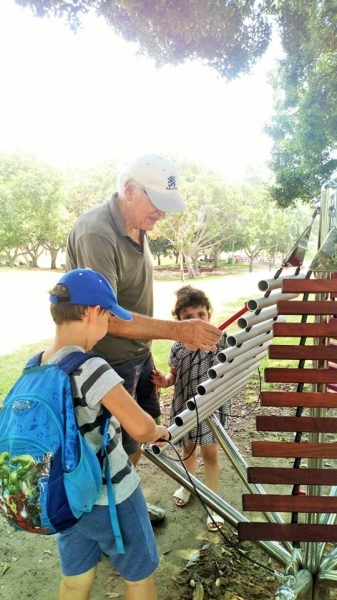 In the tropical gardens section of the park you will find our xylophone Duo, the colourful Congas drums and a vertical composition of the beautiful sounding Freechimes, a metallophone pur sang. 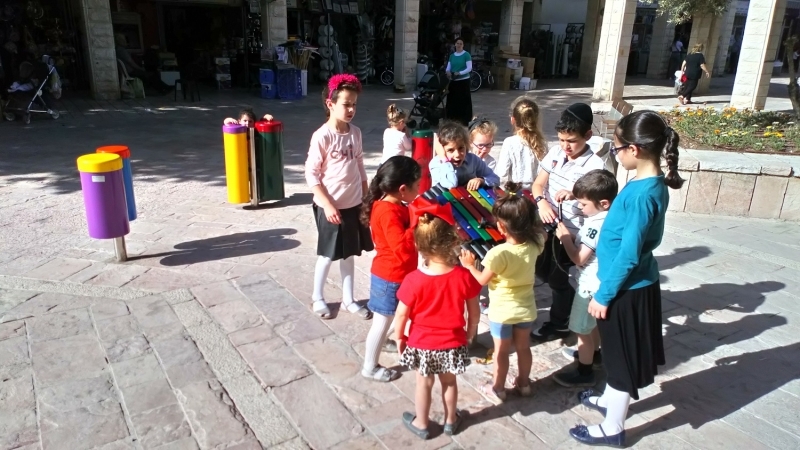 2016-01-25 12:02:09 - The children from primary school Neot Ilana in Rosh HaAyin can now enjoy the fun of making music together in the open air. 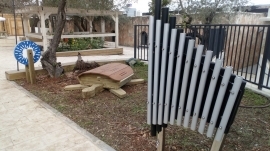 Kesem Yarok Music Gardens recently installed here the xylophone Duo - a single instrument that offers place to 2 players - as well as a set of 3 colourful Congas drums, all instruments from our populair Percussion Play program. 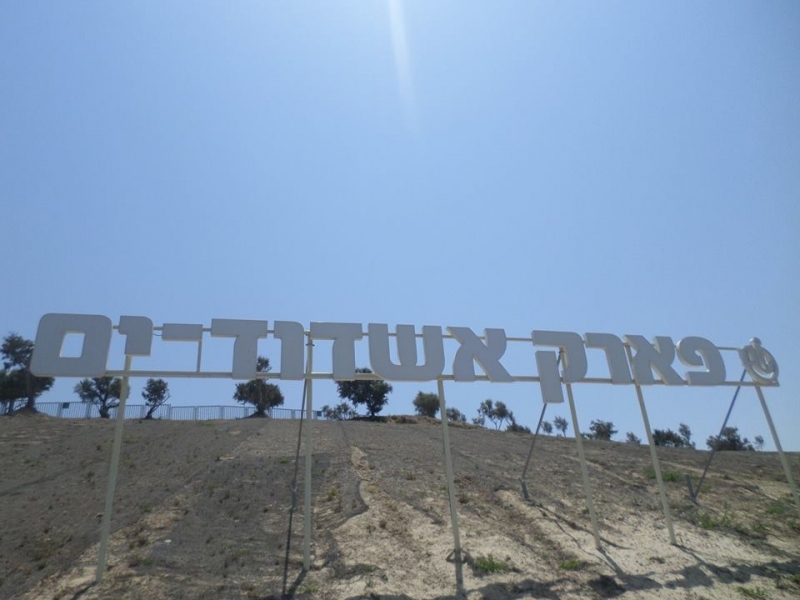 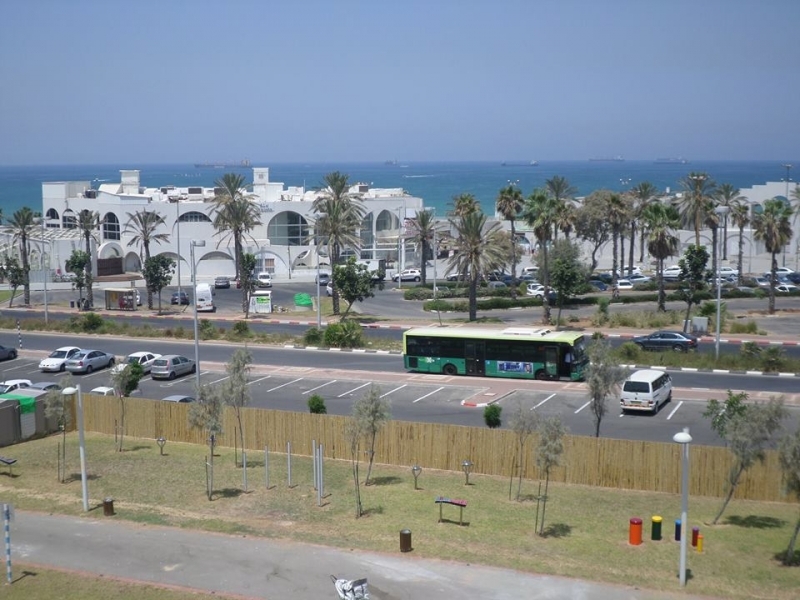 2015-08-15 07:58:37 - Looking out over the Mediterranean Sea, the new developed Park Ashdod Yam contains now a Kesem Yarok Music Garden. 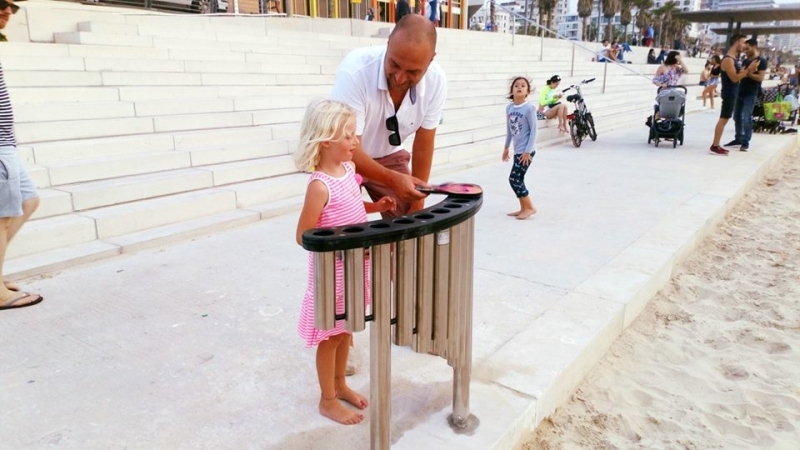 Recently installed in a section of the park visitors can enjoy the fun of making music together on different kind of drums, outdoor xylophones and of course the tall emperor chimes, completing a day at the beach with a finishing bath of sounds! 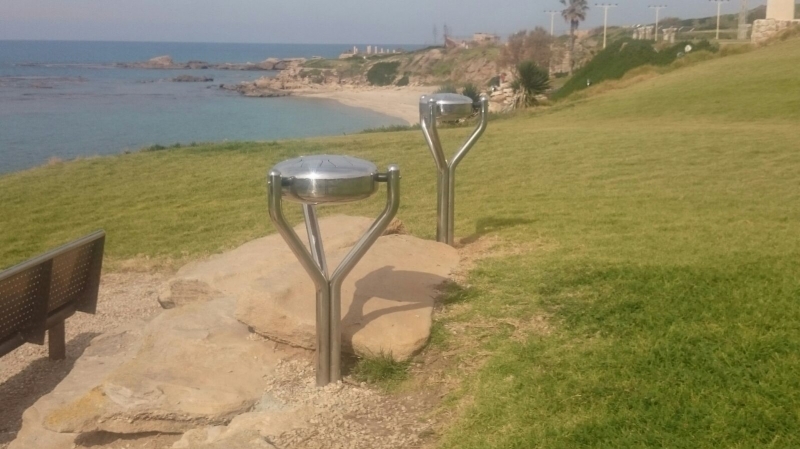 In this very salty environment the municipality of Ashdod has chosen for our stainless steel instruments, a well considered choice. 2015-08-14 21:47:49 - For the Municipality of Tel Aviv, Kesem Yarok Music Gardens has recently realized this Music Street at the well known Tel Aviv Yafo Music Center. 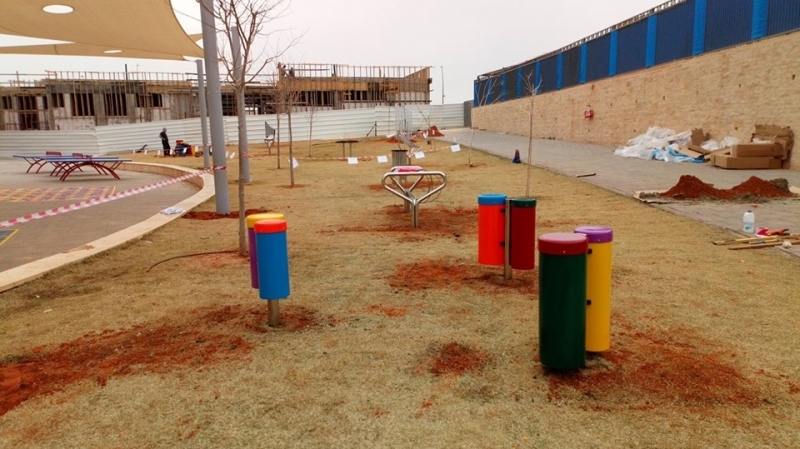 On the way to their music lessons and performances, students,pupils and teachers can now enjoy outdoor music instruments such as the Tembos, Emperor Chimes, Babel Drum and the colourful Congas. 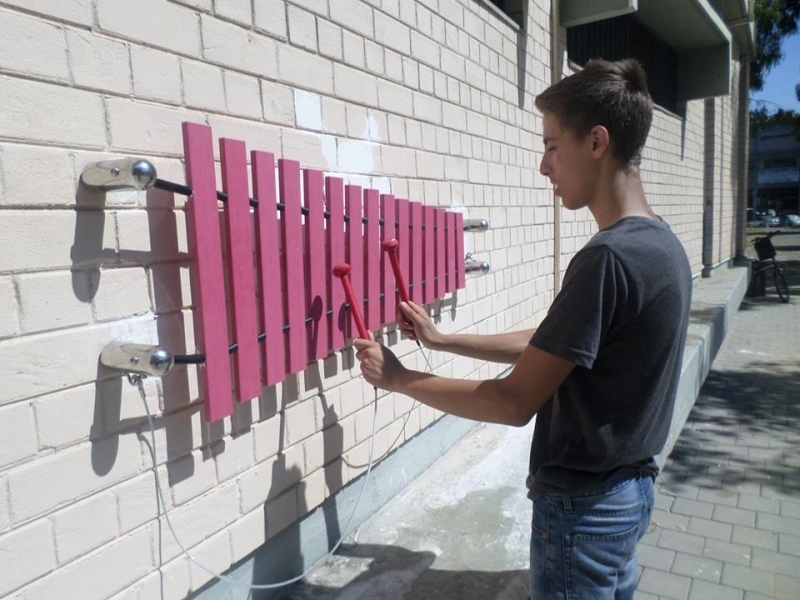 On the blind wall we have installed our Wall Marimba, containing a range of GRP notes, tuned into a C-Major Pentatonic Scale. 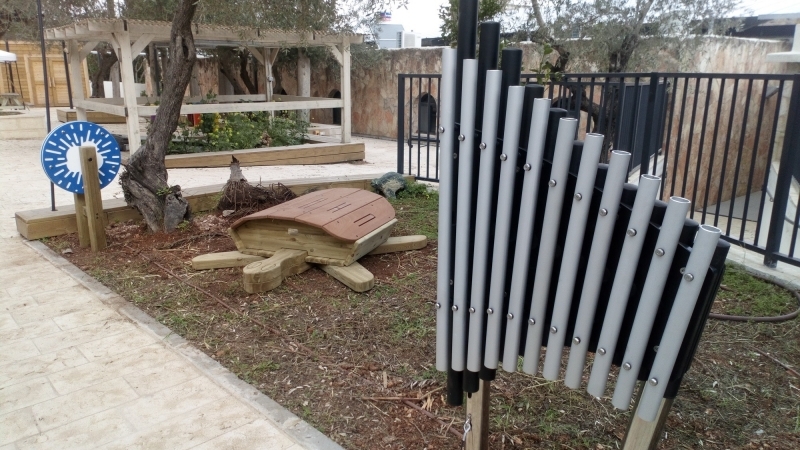 At school and carecenter for special primary education Maon Tal Liman in Kfar Saba, Kesem Yarok recently realised this new Music Garden. 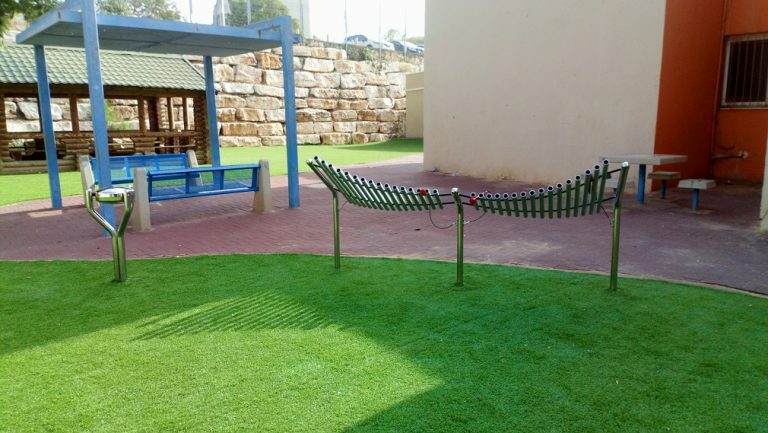 Children here can now enjoy the wonderful experience of making beautiful music in the outside. 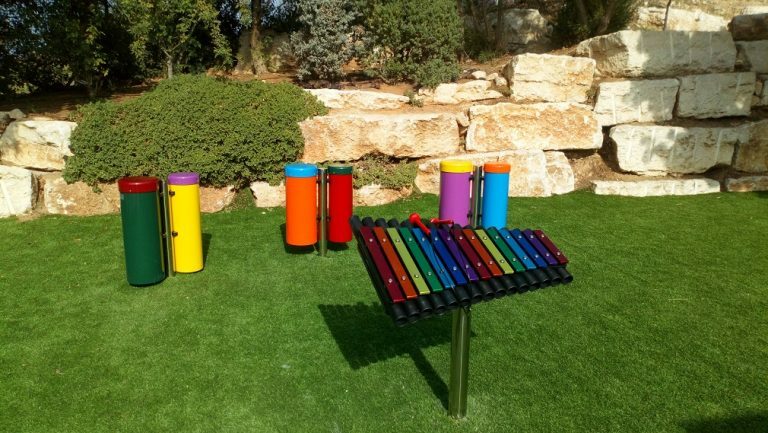 You see our xylophone "Duo", the 5 drums called Rainbow Sambas as well as the 2 tall Emperor Chimes for a unique sensory experience. 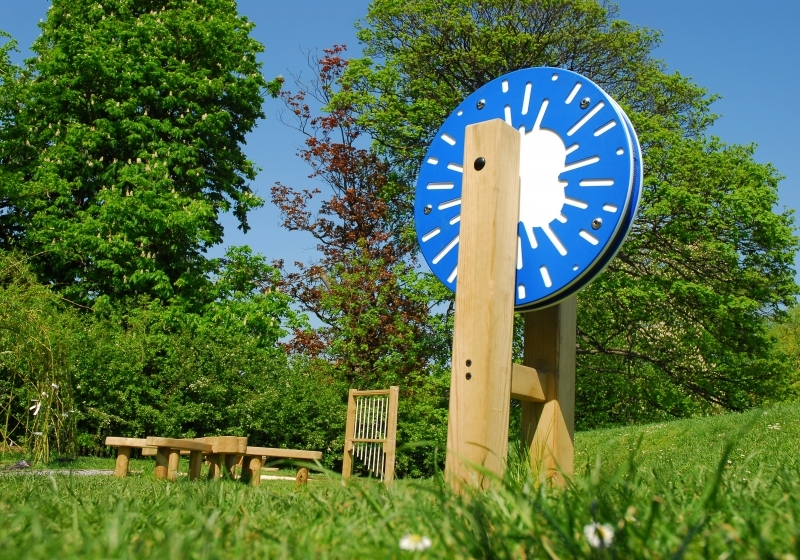 The blue rainwheel is spreading the sound of falling rain and completes this bath of sounds. 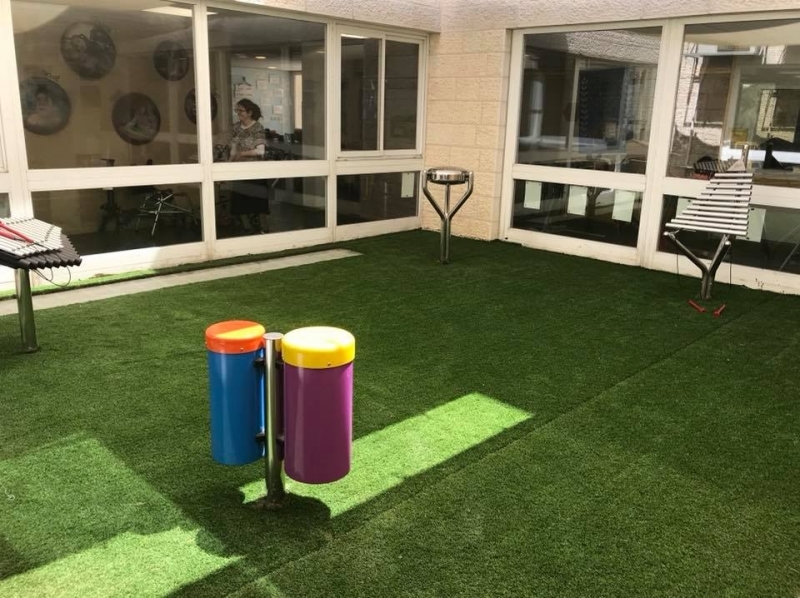 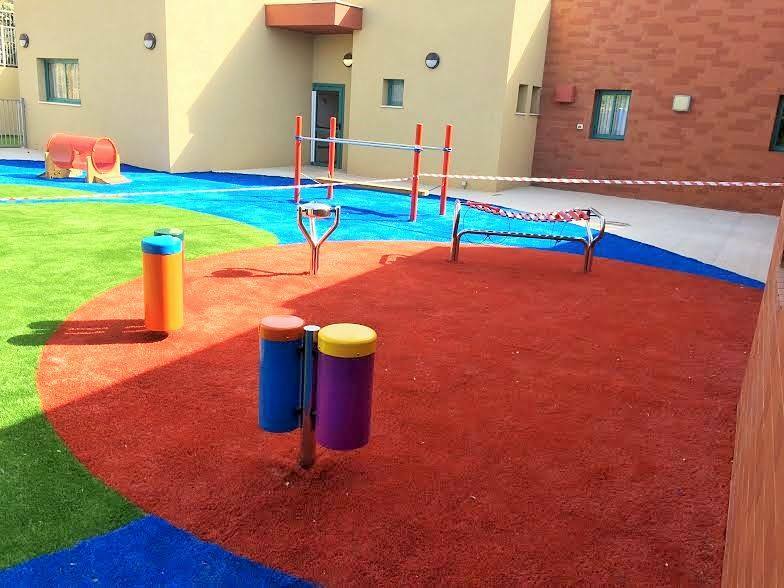 At this school for special education in Jerusalem we recently installed our products to create a beautiful music and sounds garden. 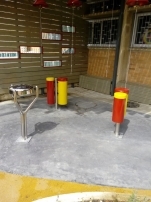 All instruments are accessible by wheelchair. 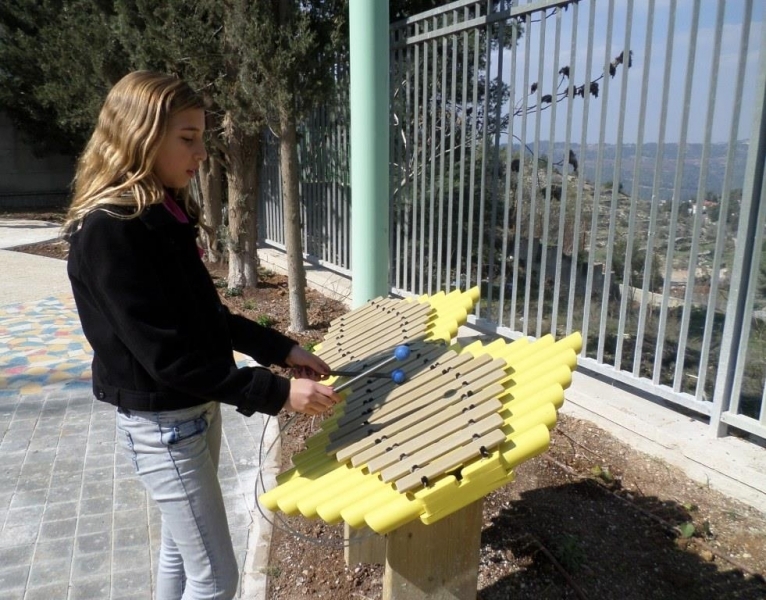 Children of all abilities can now enjoy the pleasure of making wonderful music with the Sansarimba xylophone, while overviewing the Jerusalem hills. 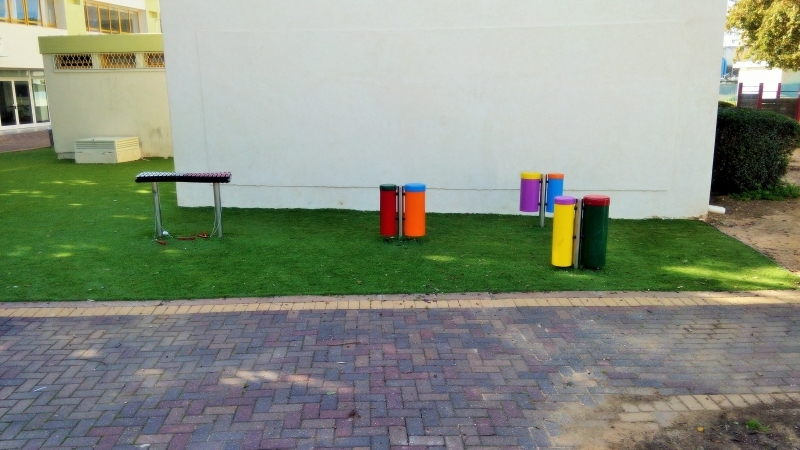 The colourful Rainbow Sambas you see are tuned drums that are positioned in a scattered way for music therapy means. 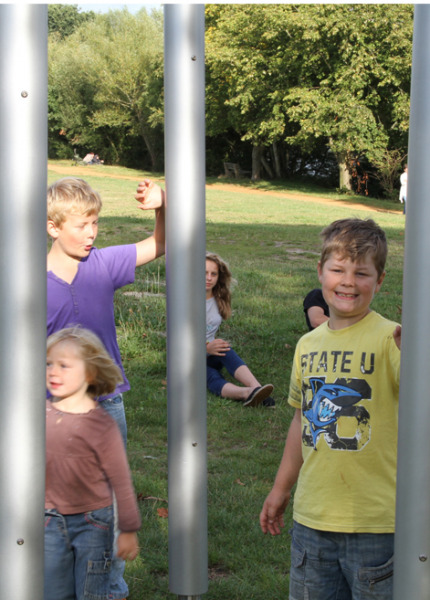 The 6 long stainless steel Emperor Chimes on the background do not only sound great, but also let you feel the sound's vibrations! 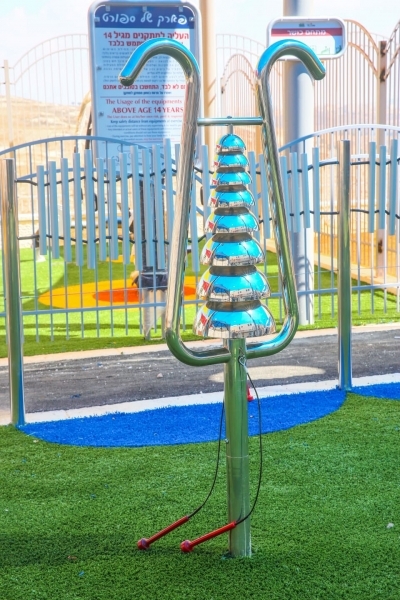 The sound of falling rain is heard when spinning the blue Rainwheel in front, completing this warm bath of sounds. 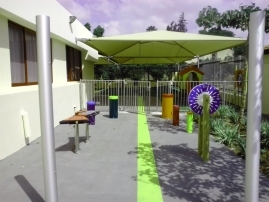 All instruments are accessible by wheelchair and designed for permanent outdoor use. 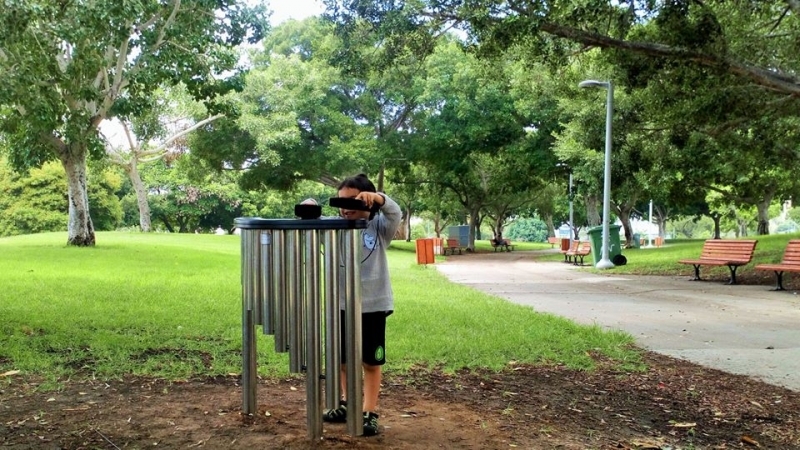 These majestic Emperor Chimes make a wonderful music area in any public park. 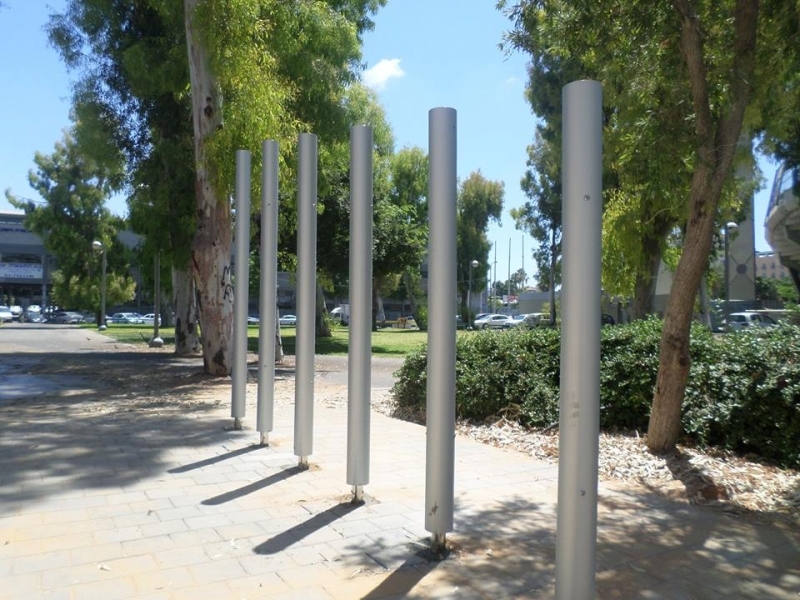 Made of tough stainless steel tubing for lasting outdoor duribility, the Emperor Chimes are tough robust instruments, ideal for the challenging environments so often associated with public parcs. 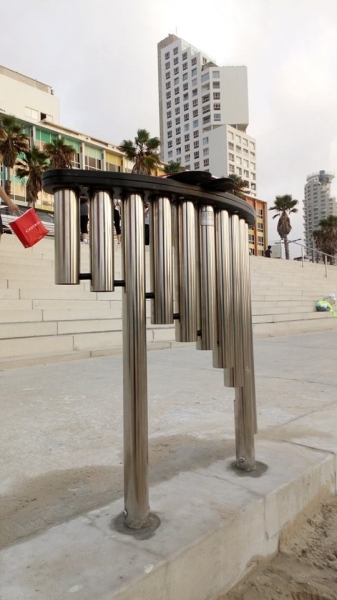 With the largest standing over 3m in height, these chimes really are large in sound and size. 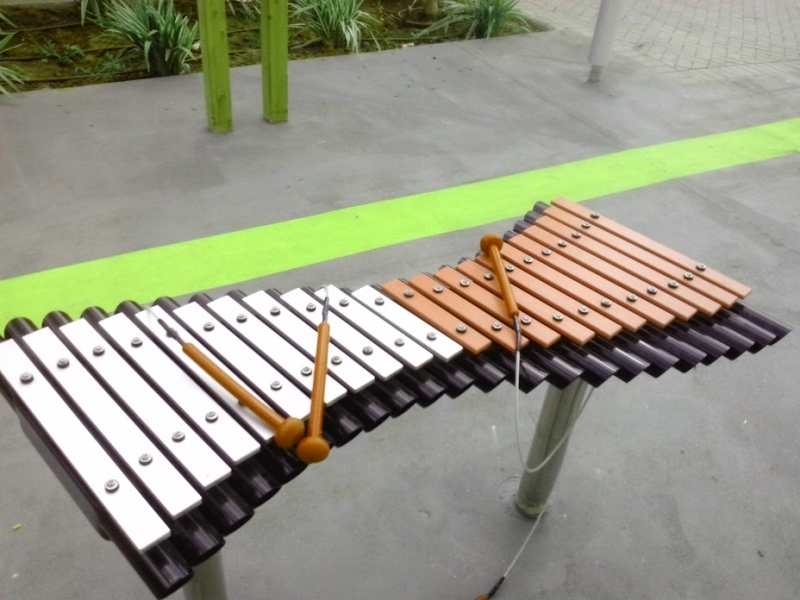 Three different sizes span the primary c-major chord with a very deep, profound sound and unparalleled sustain. 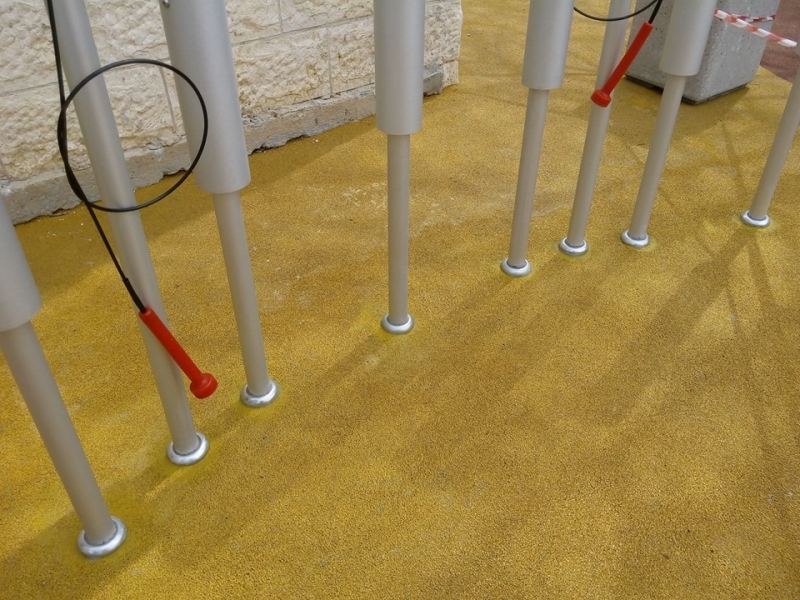 Striking the chime just about anywhere along the tube produces a deep, resonant, powerful tone that you not only hear, but can feel as well. 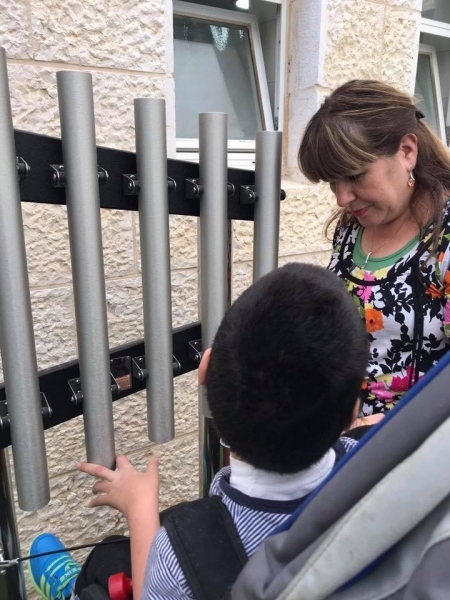 The harder you strike, the more it will vibrate, creating a louder sound with such resonance you can actually feel the vibration through your entire body. 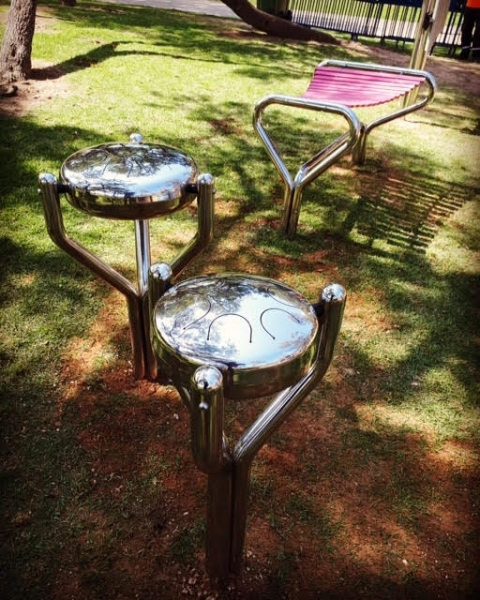 It is an amazing experience and you really do feel like you have been bathed in sound! 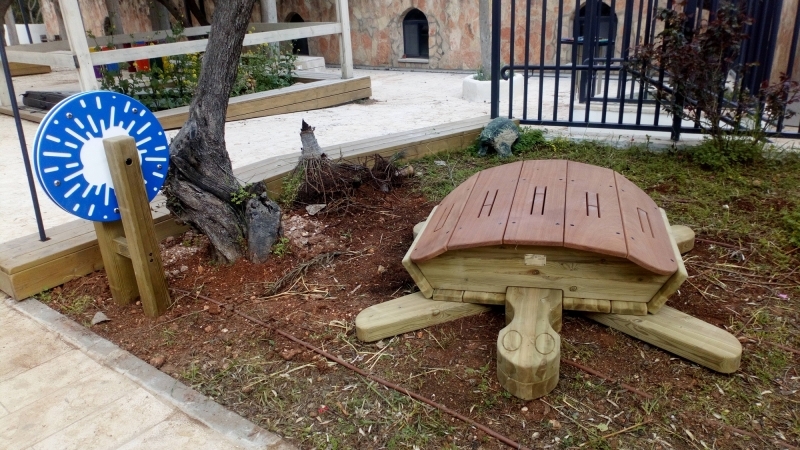 Example with music chimes, our engraved dragonfly. 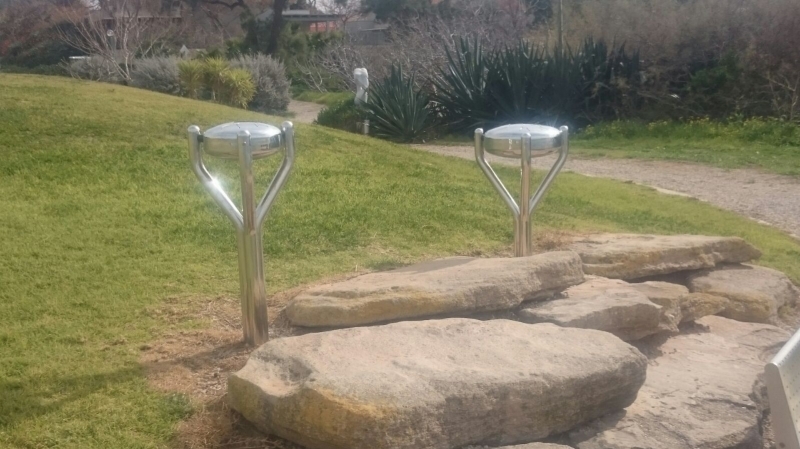 Nature is all around. Mind the blue disc up front; by turning this rainwheel one hears the relaxing sound of falling rain.